If you know me IRL you would know that I have horrible allergies. One of the worst offenders to my system, surprisingly, is feathers. When I was tested for allergies and the doctor told me feathers got a huge reaction, so I decided it was time to get rid of all of my favorite feather-filled things like my down comforter, feather pillows and throw pillows and my puffy winter coats and vests. Moment of silence for all of my cute feathered things. So now, I'm on the hunt for a feather-free winter coat. Why? Because I'm traveling to Chicago and Pittsburgh mid-November for work and need a warm one. I have a wool peacoat and a fleece peacoat but neither of these are warm enough. Also, I'm beginning to be anti-wool. It makes me skin itch like crazy and makes my hair static-y. Plus, it's kind of good just to have a very warm coat that isn't a fashion coat. You know what I mean? 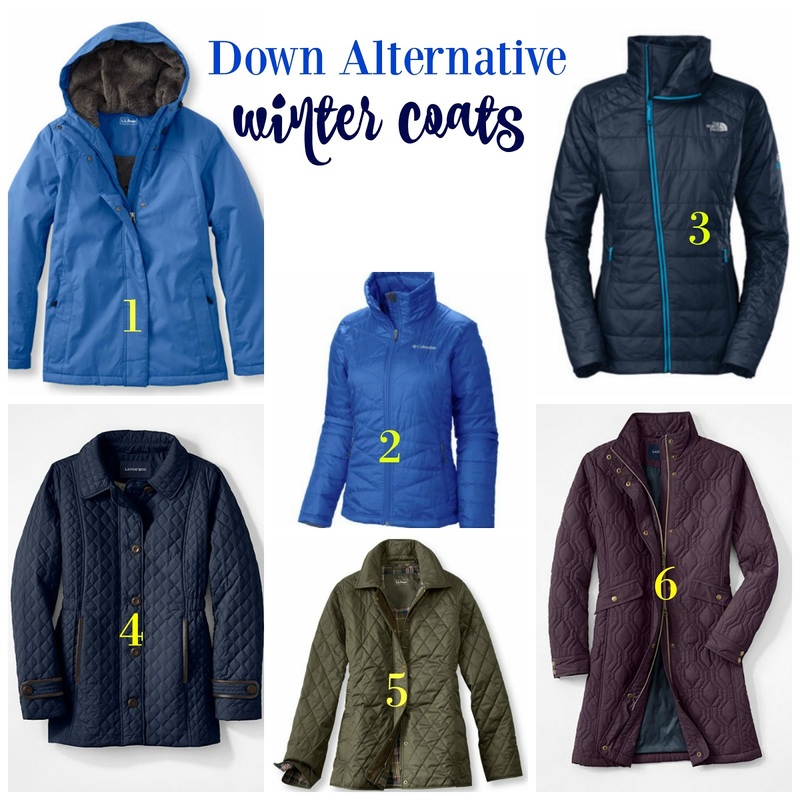 As I perused The Internets I was surprised at the number of down-free coats I found! I was thinking I may have a total of 2 options but I found quite a few! Below are some of my favorite down alternative, non-wool winter coats. I ended up going with #4 the Lands End Primaloft quilted parka. I like the shape of it and it's not too puffy. The final verdict will be when I actually receive it, so stay tuned! After the polar vortex up here a few years ago, I got a knee length down coat and I've never looked back. Good luck with your pick! They're all nice. I think you should provide many more model life jackets so we will a youthful style. Warm coats for the winter! :) I think about your product. They lined the right warm coat. Like most # 1, suited for hiking in cold weather!